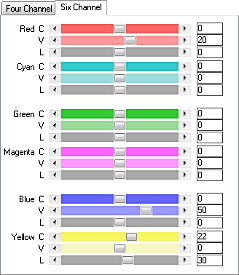 Channel Saturation (formerly Four Channel Saturation) allows you to adjust the chroma and vibrance of four or six opponent colors independently. Four channel saturation is a simple parametric analog of L*a*b* curves, with a fixed center point so the white point does not change; but it uses the YCbCr color space with RGB images. Six channel saturation uses the YCbCgCr color space, and divides the hue circle into six halves rather than four, with more resulting overlap. A major difference between this type of saturation adjustment and the use of a Hue/Saturation layer is that this method may change the hue as well as the saturation. It is useful for separating colors of low saturation, such as the tints of weathered wood; or closely-spaced colors, such as the greens of mixed foliage. The lightness of each color may also be adjujsted. 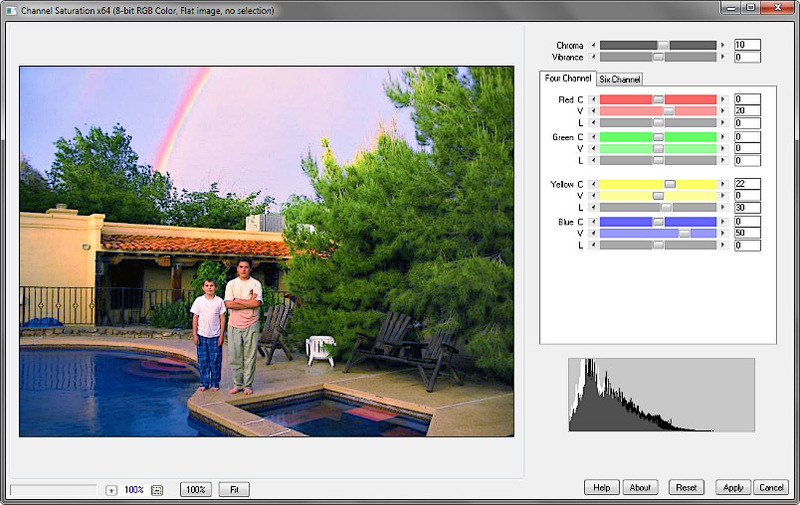 The histogram is a saturation histogram. White (background) is the original image; black (foreground) is the processed image. ChannelSaturation_x64.zip version 1.201, 439 KB, 64-bit applications. ChannelSaturation.zip version 1.201, 435 KB, 32-bit applications, Windows 32 or 64 bit.